We all know about the new spring trend, florals. I have NEVER been a floral type girl. Mainly because my mother loved floral clothing ever since I can remember and she wore them often. She wore those really long dresses with big floral prints- shoulder pads and all. Now let me say they weren't necessarily that bad looking per say... I guess seeing them soooo much growing up equates them in my head with "mom" clothes. Anyways- they are everywhere now! And I have to admit that I am warming up to them. 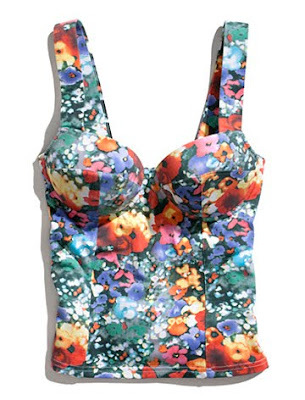 Clever floral prints in modern trendy cuts are slowly wooing their way into my fashion heart. That along with seeing so many fashion bloggers share their interpretations of the trend like CurvyGirlChic stepping out in a fabulous summer bright floral top or Tiffany at Fat Shopaholic expressing her undying love for floral print. I decided to step out and give it a try. So while I was out shopping at H&M the other day I picked up two pieces. One top from the new garden collection and a skirt. I chose these pieces because I felt I they were versatile and I could easily find a way to incorporate them into my own personal style.- Don't you hate when you take a chance on something and it just ends up hanging in your closet with the tags still attached for years to come? I decided to feature the top first. I love this top because of all the different ways I can work it. It has a vintage style to it with an artistic watercolor floral print in a thick incredibly soft cotton. The built in bra fit perfectly despite my DD cup size. I tried it three different ways with my harem pants- One casual chic with a denim motorcycle jacket; One going out look with a sequin H&M waterfall vest; and the last one more flirty vintage with a free people blazer and Aldo wedges. CLICK HERE FOR MORE OF "Boom Boom Pow"